I’m on a mission to retrain my body to enjoy early morning exercise. Even so, half 5 does feel like a rather rude awakening. I seriously consider the pleasant prospect of switching off the alarm and having an extra couple of hours kip but think better of it. It’s an effort to drag myself to the gym, but I’m pleased I do. It’s been a while since I’ve been to Kristy’s pump class and it’s great to be back. I’m pumped to the max! Kristy as usual spouts her words of wisdom! Food for thought: It’s not just what you put in at the gym that counts, it’s what you put into your mouth! I swear I could make a book of inspirational Kristy-isms. I think I will have to suggest that to her next time I see her! Early morning exercise really sets me up for the day. Work is great. My class are super cool. I swing by the shops at lunchtime looking for a pink singlet for the Mothers Day Classic on Sunday but there are none to be found. I take it as a sign. After all, I’m certainly not short of gym attire. It’s not good to be greedy! Katie, she of the Chocolate Apricots fame, gets me hooked up to two awesome websites, vegiehead and supercharged food, both of which have a whole heap of honest to goodness recipes! These will be the perfect addition to my plant-based, wholefood recipe repetoire! Check them out! After work, I throw together some of that yummy Hedgehog Slice and let it chill in the fridge while I chill on my computer! I’m trying a new recipe for Chicken Katsu tonight. David loves Chicken Katsu and it’s his number one menu choice in a Japanese restaurant. I love it too but usually steer clear as it’s not exactly hyper healthy! So I’m really happy to find this light and tasty recipe for my home made Katsu-creation! I have a little kitchen nightmare when I realise I only have Balti paste, instead of the necessary Korma, so instead of the sauce being light and creamy, it’s rich and tomatoey, but I have to say yummy all the same. It’s a totally taste-tastic twist on boring old chicken schnitzel, and it’s heaps healthier too! We finish dinner just in time to watch the Biggest Loser finale! It’s funny watching it on TV, having seen it being filmed, but it’s entertaining all the same! 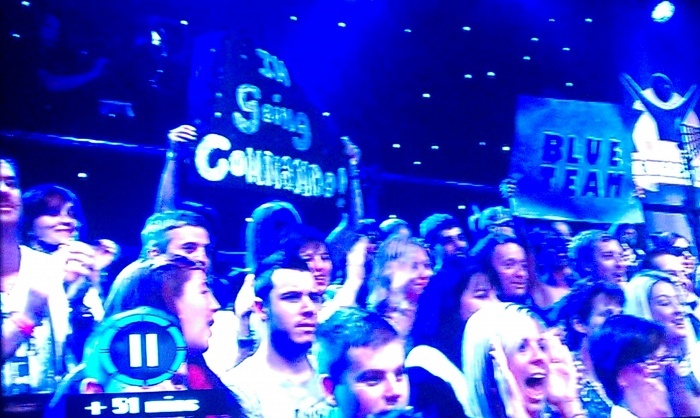 I get my nano second of fame when me and my sign saying “I’m going Commando!” are flashed with the camera! Ha! I’m famous! I receieve a surprise email from friends Adam and Leda, who have freeze framed the picture and taken a photo of me on TV! That’s just too funny! I love it!